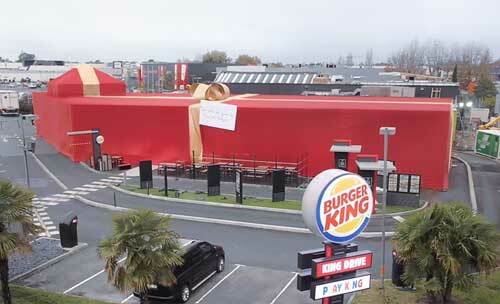 For Christmas, Burger King France decided to surprise their biggest Facebook fan by offering him the biggest gift ever. Sullyvan K. is a Burger King Bordeaux Mérignac customer. He’s aso the person that posted the most comments on Burger King France’s Facebook page; 637 and counting. To thank him, Burger King decided to offer him the biggest gift ever: His “own” Burger King. It took 35 workmen and over 1 kilometre of material to wrap it in one night. Inside the restaurant, which bears his name : “Home of Sullyvan K.”, everything was changed. He has his own parking spot, his own golden tray, his own table and even his own Whopper packaging. He also gets to eat for free at his Burger King for a whole year! From 19th December, the person who writes the most comments under Sullyvan’s film will also win one year of Burger King. There were already 40K comments only a few hours after the launch! Omni-Channel Is Hot News So What’s the Hitch?